Let’s take a look at President Obama’s economic legacy. The Washington Examiner opines on President Obama’s remarkable claim that he saved the world economy. Not so fast. 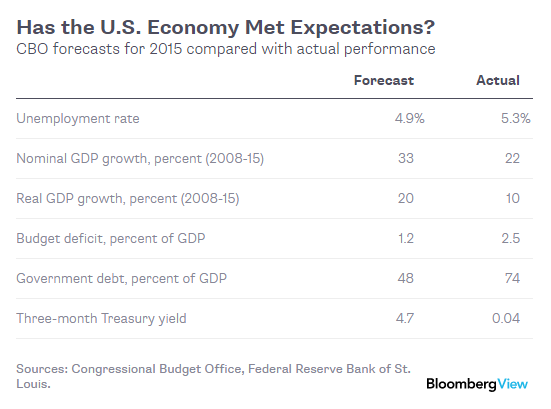 Looking at the economy’s anemic numbers the editors are less than impressed. Obama will end eight years in office without presiding over a thriving economy of the sort America enjoyed in the past. It also suggests that even the mediocre growth of recent years depended on high oil prices, which have collapsed by more than half. This is the bitter fruit of creationist economics, the erroneous belief that government activity can somehow conjure new wealth and value. The Wall Street Journal is similarly dour about Obama’s economic legacy. When did Americans decide that 1% or 2% economic growth is acceptable, that puny wage increases are inevitable, and that we should all merely shrug and get used to the country’s diminished expectations? …the first quarter is further evidence of what has been the weakest economic expansion in the postwar era. …All of this continues the slow-or-slower pace of this entire expansion that began nearly seven years ago. Each year has had a similar GDP dip, and growth has never exceeded 2.5% (2010). The American economy hasn’t grown by more than 3% since 2005 (3.3%), the longest such stretch of malaise that we can find in the Bureau of Economic analysis tables going back to 1930. …Faster growth is possible, but it will take better policies. In a column for Bloomberg, Narayana Kocherlakota, looks at what’s happened and compares it to what CBO projected would happen. it’s not hard to see why many people are disappointed with the performance of the economy during Obama’s time in office. In January 2009, at the beginning of Obama’s first term, the nonpartisan Congressional Budget Office issued a 10-year forecast for the U.S. economy, including such indicators as unemployment, gross domestic product, the budget deficit, government debt and interest rates. …The unemployment rate has come closest to expectations. …Elsewhere, the story is less positive. Total income growth in the U.S. has fallen well short of expectations, in both nominal and inflation-adjusted terms. …the federal budget deficit…still much larger than the CBO forecast in 2009 — as is the ratio of government debt to GDP. Last, but not least, Louis Woodhill shares some numbers that capture Obama’s real legacy. What makes this final comparison so damning is that Obama had the comparative good fortune to enter office in the middle of a recession. Which means, all things equal, that his numbers should look very positive. Instead, he’s managed to compile one of the worst track records. When I do comparisons, I like using the interactive recession/recovery site of the Minneapolis Federal Reserve, which allows users to compare every recession and recovery since the end of World War II. Here’s how President Obama (red line) ranks on GDP growth. As you can see, whether your starting point is the beginning of the recovery or the beginning of the recession, Obama is in last place. He does slightly better on employment. He still has one of the worst records (again, the red line), but he does beat George W. Bush’s also-anemic performance on job creation. By the way, some of you may be wondering why the employment data for Obama is so weak when the unemployment rate has significantly fallen. The answer is that the unemployment rate doesn’t count people who have given up on finding a job, whereas the Minneapolis Fed data counts how many new jobs are being created. And it’s the amount of people productively employed that matters if we want more economic output, so the Minneapolis Fed data is far more important and revealing than the official unemployment rate numbers. Unfortunately, Obama and his team haven’t figured out (or simply don’t care) that jobs are more likely to be created when government is smaller rather than bigger. By the way, this analysis presumably won’t be very compelling for Obama supporters because they’ll simply assert things could have been much worse without his policies. They may even believe the President’s claim that he saved the American economy from a Great Depression. But they overlook the fact that the economy normally bounces back quickly from a downturn. It was only during the 1930s, when Hoover and Roosevelt competed to impose bad policy, that a recession became a depression. The bad news is that President Obama’s policies haven’t helped today’s economy, but the good news is that his policies are nowhere near as harmful as the combined statist agendas of Hoover and Roosevelt. So if we want to learn a lesson on what works, the economy’s very strong boom under Reagan is a good case study. And if you want to go back further, the anti-Keynesian booms after World War I and World War II also teach important lessons. P.S. President Obama is completely correct when he points out that America’s economy is generally stronger than European economies. Unfortunately, he doesn’t seem to realize what this implies. Liberals don’t have a damn clue about what it takes to grow an economy. Diggs is 100% correct. We are in a negative jobs area ever since obama (who wanted to fundamentally change the country, was a disciple of Cloward-Piven, overload the system so it collapses) won the election. Certain fools trumpet a talking point that “we were losing 600,000 A month under Bush” (that number has since increased to over 800,000) when we actually lost 600,000 in ONE month. Not EVERY month – coincidentally the first full month after it was apparent who was going to preside over the country, December 2008. Let’s not forget that the actual unemployment numbers are much higher, as more than a few million workers have not only left the job market, they’ve left the search for work. There hasn’t been one quarter of job growth under Obama that matched or exceeded the number of new workers entering the job market. That means, for Bernie Sander’s voters, that even though there was “job growth” in that quarter, there was no net drop in the number of people unemployed.